It’s a scorcher today. Almost 90°—way too hot for late September. I usually check in on the cameras up here throughout my work day, but I lost my connection to the Puckanet around noon without any warning that the battery backup kicked in. I was worried something bad might have happened with my equipment, so I left work early, stopped home to grab the pooch and a few items I had planned to bring anyway, and headed up. Got here a little before 2:00 pm and quickly determined the issue was with Verizon, not my gear. The modem had no data signal. Same story with my phone. At least I was able to make calls; Verizon support confirmed that there was a data outage and that they had already dispatched a repair crew. Satisfied that the battery backup hadn’t melted and started the keep on fire, I unloaded my truck and grabbed a water out of the fridge. I headed back out and checked out the newly depleted brick pile. One of my craigslist brick lovers came back for more earlier this week. I moved a few around to minimize the pile height and took a quick tally. We’re down to about 600 yellow bricks and maybe 800 or so blue firebricks. 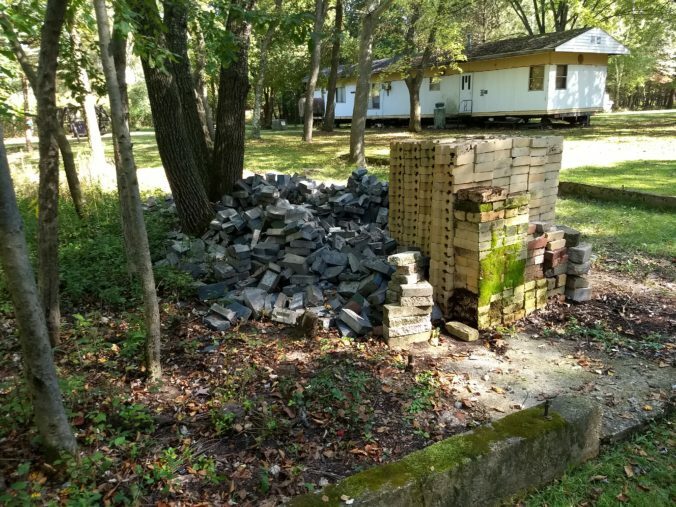 Last year, getting rid of these bricks seemed like such a monumental task. Now almost 75% of them are gone and I’ve hardly had to do any of the work. With nothing left to do in this oppressive heat, I was ready to head home. I called for Hannah. And called her again. And again. Nothing. I kept calling and calling and started to get worried. She usually sticks around so well. I started to wonder if she had flushed out a deer or some other critter and was hot on its trail. After a few minutes of unanswered calls and whistles, I opened up the pole barn and hopped on an ATV. I hoped to draw her in with the engine noise while covering more ground looking for her. I decided to check Danny’s backyard first since I last saw her sniffing around the property line behind the garden shed. I looped around his paths and was going to head out to the marsh when something caught my eye. Yep, there was Hannah. Stuck in the biggest live trap I’ve ever seen. She didn’t seem any worse for the wear, just embarrassed. There were little chunks of fish around the door trip mechanism, so at least I knew what drew her in. I let her out and she made a bee-line back to the yard. I followed with the ATV and parked it. As soon as I cut the engine, I could hear that Danny was talking to someone. I wanted to head over to and find out why the hell he had set such an enormous trap, but Hannah wouldn’t follow me through the woods. Guess she learned her lesson about leaving the yard. I closed up the pole barn and keep, got Hannah to hop in the truck (no hesitation there) and pulled out of the driveway. I saw Danny out in front of his garage talking with someone, so I pulled in to let him know about Hannah’s misadventure. Turns out the guy he was chatting up was our other neighbor John Grady, a man I probably haven’t seen since I was about four feet tall. The trap was Grady’s; he’s been catching raccoons with it, sometimes two or three at a time. A few years ago, they got into his cabin’s crawlspace and did a number on his insulation and wiring. Now he’s at war with them. He saw Hannah in the trap but didn’t know who’s dog she was (or if she was dangerous) so he came to ask Danny if he knew anything. I guess Danny’s dog, Buck, got trapped a while back, too, but learned from that experience and never went near the cage again. Hopefully Hannah has the same plan going forward. I talked with Danny and Grady for a bit and was glad for the opportunity to meet Grady again as an adult. There were no hard feelings about the trap; he was just happy to find out she was one of ours and was friendly. Guess he’s had some interesting encounters trying to release feral cats he’s accidentally caught and was relieved he wasn’t going to have to struggle with a giant, aggressive dog. I was cooking alive standing in that driveway in my black shirt, so I bid the guys farewell and headed home with my freed prisoner around 3:00 pm. The Puckanet did just what I taught it to do and reconnected to my home network around 8:30 pm as soon as Verizon repaired the outage.